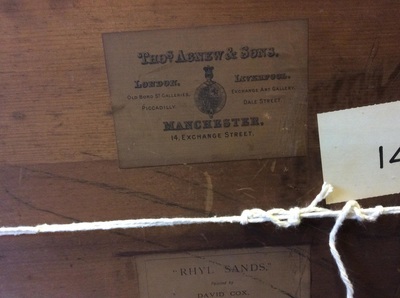 Dealer's label, back uc 'Thomas Agnew's & Sons, Manchester'. Chalk inscription on stretcher, back ul 'Holda'. Extensive research has not revealed any artist with the name H Llangl, from which it is possible to conclude that given the quality and detail in the painting, the name must be contrived by another artist who, on this occasion, did not want to put his or her own name to the picture. ​Sartin's catalogue (August 2001), understandably, gives the title of the painting as A St Bernard Dog, but an in-depth look into alternative breeds brought up The Newfoundland Club of America website, which provided an image of a dog that looked very similar to the one in our Collection. This was Landseer's well-known painting, A Distinguished Member of The Humane Society, the discovery of which established an important link between the breed of dog known as the ‘Landseer Newfoundland’ and the dog described as a 'St Bernard'. At the time of the painting the breed would have been known as Newfoundland. The story behind Landseer's Newfoundland is that the distinguished dog in the painting is 'Bob', who was shipwrecked off the coast of England. As a stray he became well-known along the London waterfront, saving people from drowning; there were twenty-three rescues recorded, spanning fourteen years. He was declared a distinguished member of the Royal Humane Society, which not only entitled him to a medal, but also to food every day. Landseer used his cousin’s dog, ‘Paul Pry’, bred by Phillip Bacon, to stand in for Bob, who could never be found for Landseer to use. head stands out against the lightest part of the sky, seagulls are flying about and the water laps against the stone block where the iron ring is fastened. The picture is quiet, but there is a feeling that something is about to happen. Should there be a cry for help Bob would be off to the rescue! The original painting of Bob, first exhibited in 1838, hangs in the Tate Gallery, London. An engraving of this painting was made by Thomas Landseer, his brother, with extensive retouching by Sir Edwin to assure perfection. We know Edwin was obsessed by dogs from a very young age because the artist and Head of the Royal Academy Schools, Johann Fuseli, asked about the 10 year old Edwin, 'where is my little canine friend? ', or 'dog boy? ', when he could not see him in his drawing class. 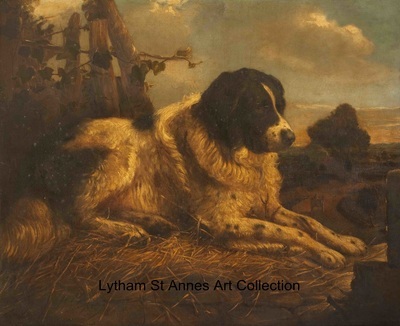 The life-size representation of A Newfoundland Dog donated to the Lytham St Annes Art Collection is also sympathetically painted in fine detail. In my opinion, despite the dog not being in an animated state - see Richard Ormond's comment below with regard to his passiveness - I believe there is a tension in the pose of a the dog, which does not look the viewer in the eye, instead he is looking towards the threshold of what could possibly be a doorstep, psychologically distant from us. We sense he is waiting quietly, which in itself is an action, the action of waiting silently for his master to return or arrive? Surrounding the nose and mouth is a ring of white fur, a white line of hair travels up the centre of his face, dividing the solid black of his ears and head, his eyes are beautiful bright and brown. His nose is black, moist and warm looking. Our eye is drawn along the dog's head, following the line of his beautiful painted fur towards a broken fence. The fence contains and holds the viewer within the scene. The clinging ivy guides our eyes gently out towards the spacious skies and open country landscape below. In the distance we see a cart travelling away from us on a winding road. We notice the cobbled ground area beneath him is strewn with yellow straw. If we think of A Distinguished Member of the Humane Society, could this suggest a pedestal such as Paul Pry sat on? Lord Byron wrote a poem, Epitaph to a Dog, in homage to his dog, ‘Boatswain', which was also a Newfoundland. 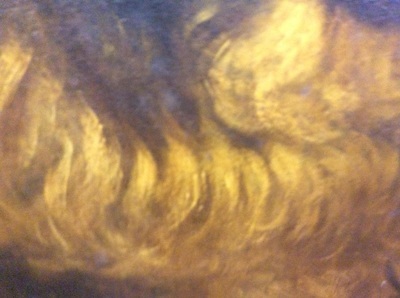 It starts, “Near this spot are the remains of one who possessed Beauty without Vanity, strength without Insolence, Courage without ferocity………” Sentiments that resonate when viewing the dog in our painting. Edwin Henry Landseer, the youngest son of an engraver, was a brilliant animal painter, whose work had added appeal in the Victorian age because of his tendency to give his animal scenes a moral dimension. These pictures were widely circulated in his time in the form of engravings, often made by his brother, Thomas. From 1815 the three Landseer brothers studied under Benjamin Robert Haydon, the historical painter, who encouraged Edwin to study animal anatomy. 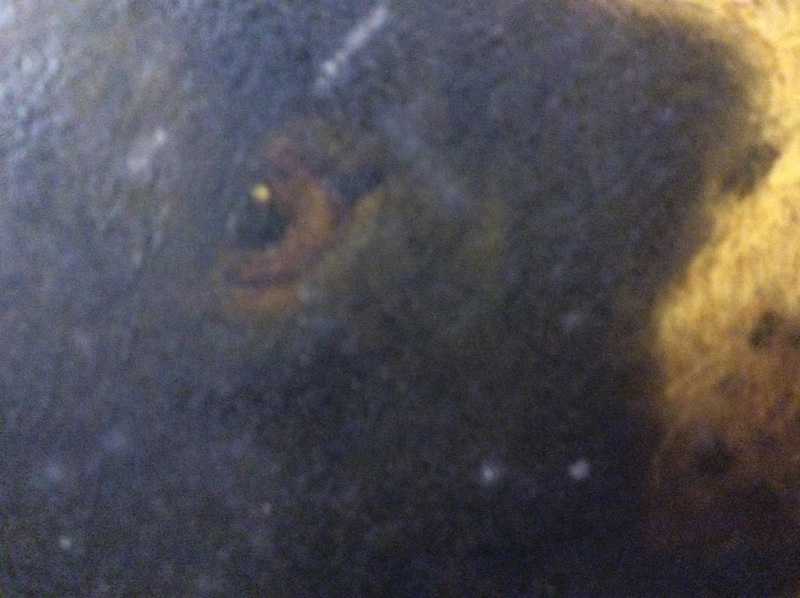 In 1816 Landseer entered the Royal Academy Schools, although he had already exhibited in the Royal Exhibition Summer Exhibition the previous year. He was elected Associate of the Royal Academy in 1826, aged only twenty four, and full Academician in 1831 when not yet thirty. In 1824 Landseer made the first of many visits to Scotland where he fell in love with the Highlands, which inspired many of his later paintings, such as The Monarch of the Glen (Royal Academy 1851, John Dewar & Sons Limited). He also visited Sir Walter Scott, who admired his paintings and chose him as one of the illustrators of his Waverley novels. In the 1830s Landseer's work gained wide popularity and was bought both by the aristocracy and the newly important middle class. He moved freely in aristocratic circles and after 1836 enjoyed royal patronage, especially during the 1840s when Victoria and Albert also discovered Scotland. He paid his first visit to Balmoral in 1850 to paint a large group portrait of the family. That same year he was knighted, despite the fact that the painting was never finished. After a breakdown, partly caused by the failure of the royal portrait, Landseer had a permanent fight against depression and ill health, although he continued to produce outstanding works until almost the end of his life. In the 1860s he modelled the lions at the base of Nelson's Column in Trafalgar Square and these were unveiled in 1867. In 1866 he declined the presidency of the Royal Academy and from 1870 sank slowly into madness. 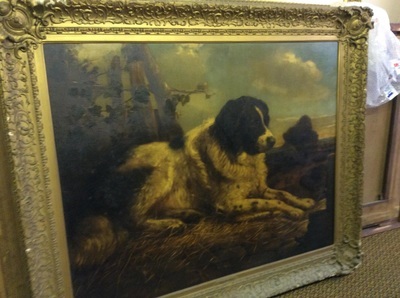 RECENT INTEREST IN THE DEBATE - LLANGL OR LANDSEER? After seeing a high resolution image of the painting, Dr Denis Conlon, who has written papers on the Landseer ECT breed (European Continental Type), confirmed that 'it is very definitely a classic example of a Landseer dog'. 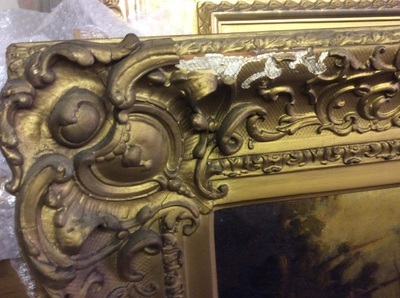 He then kindly forwarded the image to Richard Ormond, an art historian who specialises in Victorian paintings. A former deputy director of the National Portrait Gallery, he organised a major exhibition of Landseer's work at the Tate Gallery in 1981. He wrote, ' I cannot persuade myself that the picture is by Landseer. There is something too passive about it, and the surroundings seem too conventional. On the other hand the treatment of the dog has some of the hallmarks of Landseer's style in the early 1820s'. Having read this somewhat inconclusive evidence, Conlon pointed out that, 'I know of a copy of Landseer's A Distinguished Member of the Humane Society where the dog alone is by Landseer and the background is filled in by his sister'. ​Could this be the case here? 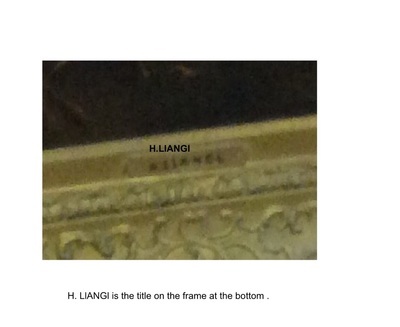 That the Landseer family collaborated on this painting, submitting it under the name H Llangl. Henry Landseer, Edwin's uncle Henry (after whom Edwin was christened), entered the Society of British Artists exhibitions with his more celebrated nephews and niece, particularly during the years 1821 to 1823; the names of H Landseer, E H Landseer and Miss Landseer frequently appeared together, which coincides with Ormond's comment that 'the dog had some of the hallmarks of Landseer in the early 1820s'. His sister, Jessica, was a talented painter and an engraver of some of her brother's works; she became his housekeeper in later years. Another artist in the family was George Landseer (1829-1878), Thomas' son, who attended the Royal Academy Schools in 1846 and exhibited there between 1850 and 1858, before setting up a studio in India. If he had been involved, as the end initials suggest, it would mean that the picture was produced at a much later date. is of the utmost significance here is the dealer's label. 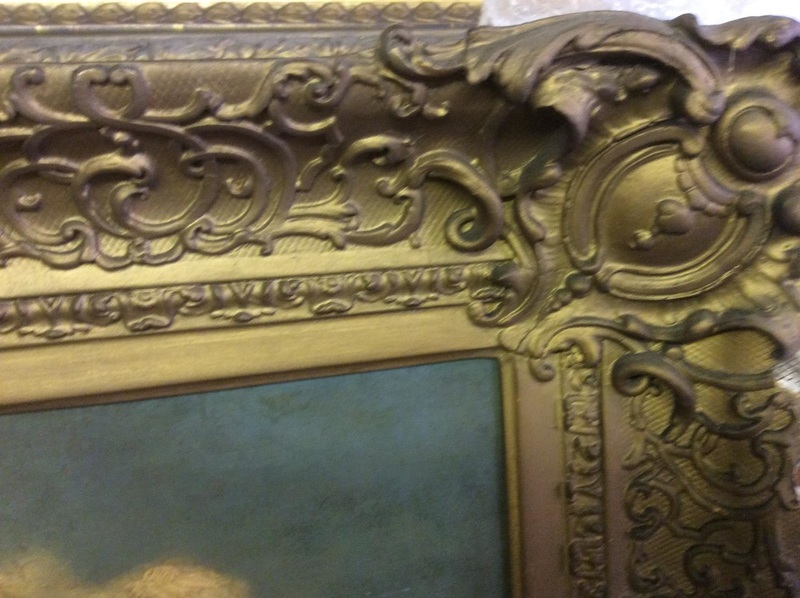 If a prestigious company, such as Agnew’s, sold this painting then it must be by an artist of some merit. It is extremely well-painted and its very size suggests its importance to either the artist or the person who commissioned the painting. 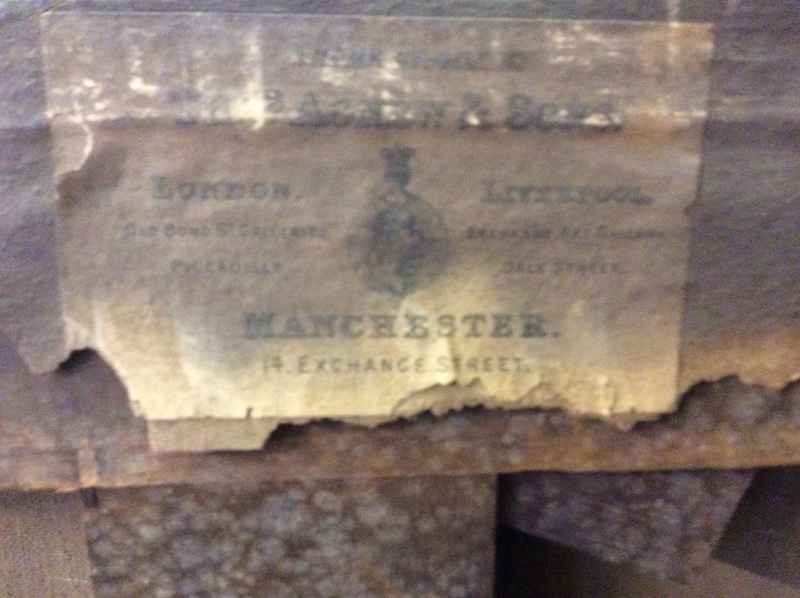 Thomas Agnew & Sons was established by Thomas Agnew in Manchester in 1817 and opened its London gallery in 1860, where the firm soon established itself as one of Mayfair’s leading dealerships. Since then Agnew's has held a pre-eminent position in the world of Old Master paintings and was instrumental in promoting contemporary British art in the late 19th century. Over generations, Agnew's has acted as principal agent and advisor to some of the most important collectors of their time, including Edward Cecil Guinness, 1st Earl of Iveagh, Alfred Beit, Alfred and Ferdinand de Rothschild and more recently Paul Mellon, Norton Simon and the Samuel Kress Foundation. Agnew's also often served as agent in the auction rooms for the National Gallery, London, and has been involved in placing masterpieces in major museums around the world. 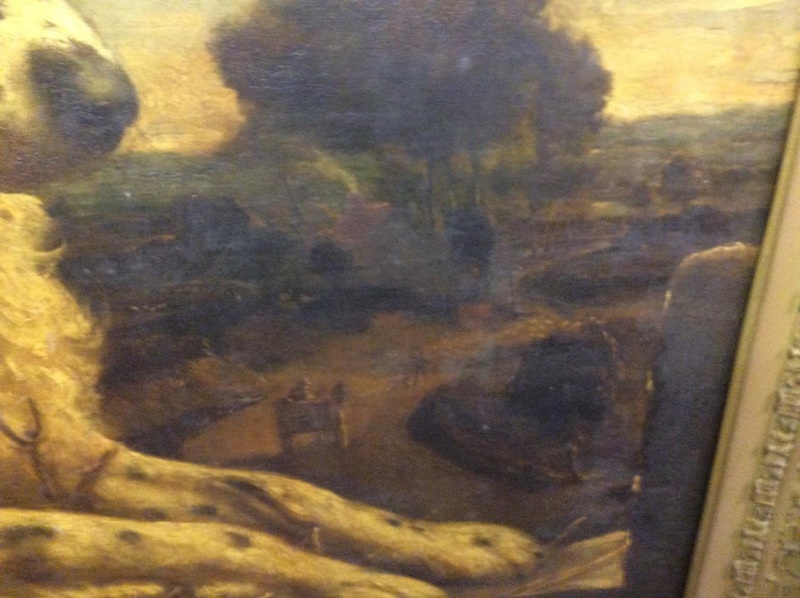 The gallery has handled works by, amongst others, Caravaggio, Van Dyck, El Greco, Frans Hals, Poussin, Rembrandt, Rubens, Vermeer, Titian, Turner and Velázquez, including the latter’s Rokeby Venus in the National Gallery. In 2013, after nearly two centuries of family ownership, Agnew's was purchased privately and is now run by Lord Anthony Crichton-Stuart, a former head of Christie’s Old Master Paintings Department, New York. The National Gallery has acquired the archive of art dealers Thomas Agnew & Sons Ltd, following the firm’s decision to close its Albemarle Street Gallery in 2013. The archive, which dates back to the 1850s, consists of detailed stock books, daybooks, diaries and huge leather-bound account ledgers that provide an unprecedented insight into the activity of one of the world’s most important international art dealers. 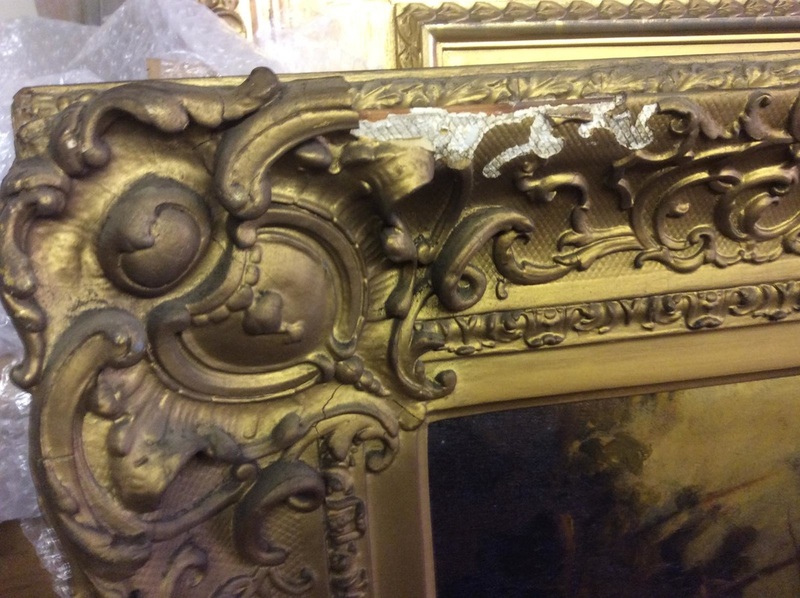 It complements the National Gallery’s own rich archive and establishes the gallery as a centre of research for the study of collecting, the art market, taste and provenance. Researchers will benefit from improved access to an outstanding and little-studied collection spanning more than 150 years. 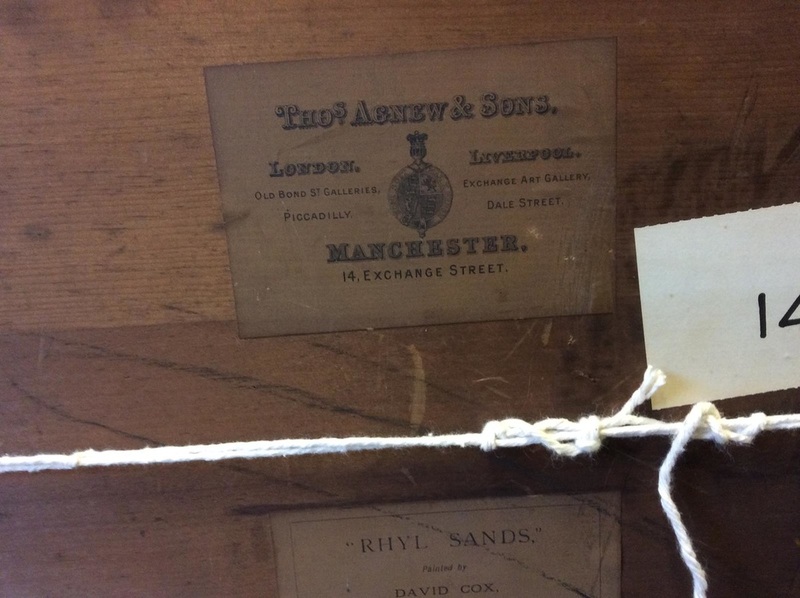 Photos from the Thomas Agnew & Sons Picture Book record of 1850s sales at the National Gallery Archives - you need to view them page by page looking for clues. 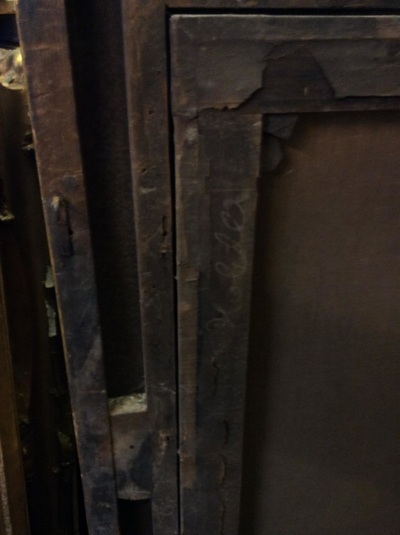 Photos of pages from the Agnews Picture Book 1; they are the day to day sales records showing the artist's name, the date the picture was bought and from where. 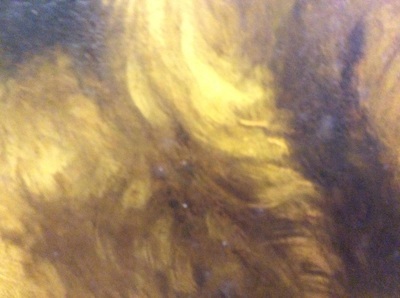 It also shows whom the painting was sold to, on which date and for how much money. Many of the same names recur, both artists and buyers. The paintings mainly have descriptions such as Landscape or Girl and Dead Bird. 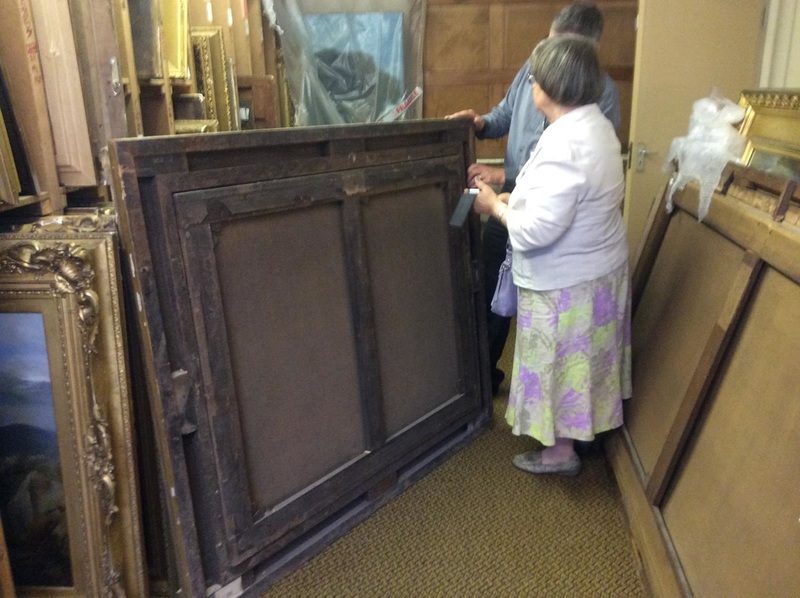 The donor, Councillor H J Burney, born 1890, married Lilian Jackson, born 1895, in March 1948. Lilian died on 24 December 1980 and Henry in March 1987. No other marriages were recorded and given their ages when they married there would not be any children. 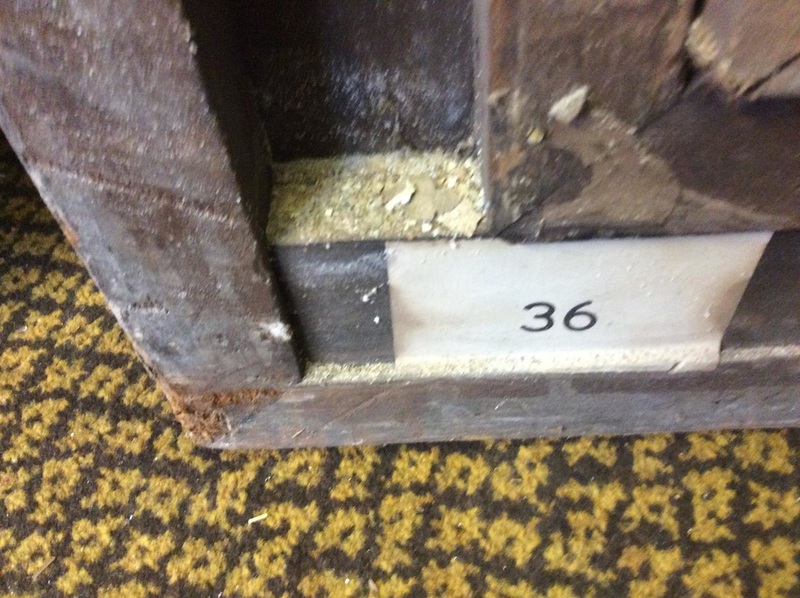 Apart from these details there is no other evidence of family in the area, although there was a Henry Burney with the address Apartments, 27 Park Road, St Annes in 1934.